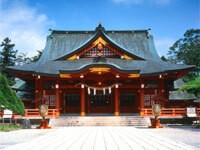 The Hall of Worship represents a serene combination of traditional Shinto and modern architectural designs. The steel-reinforced construction is topped with copper roofing, and encloses a total area of some 300 square meters, forming the central architectural structural of the entire shrine. What is the Haiden ? The Haiden, translated variously as "oratory" or "hall of worship," is the structure where people approach the kami's presence to offer their worship. Normally found just in front of the Honden (Main Sanctuary), the inner part of the Haiden serves as the area where sacred prayers are offered and ritual worship is performed by the shrine's priests.Together with the Honden, which enshrines the physical emblem of the deity itself, the Haiden is one of the most important architectural structures in a shrine. the kami are requested to apply at the prayer office. When paying one's respect before a Shinto shrine, it is customary to worship according to the prescribed form, "two bows, two claps, one bow." The bow is an expression of respect before the kami, while the bringing of one's hands together is said to represent the union of yang and yin, and thus harmony ; the clap is said to represent variously the spirit sound heard at the first opening of heaven and earth, the opening of the rock cave of heaven, and other deep meanings. 1. Bow deeply two times. 2. Bring your hands before your chest and clap twice. 3. Bow deeply once more.